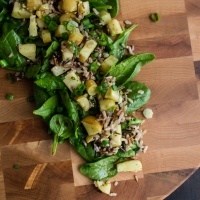 Roasted Parsnip Spinach Salad | Naturally. Let’s talk about using vegetables you might not use, and using them in fun and exciting ways. If you’re venturing outside of your traditional Thanksgiving meal, you might be using a few parsnips in (or in place of) your mashed potatoes. I really love parsnips roasted because it’s got such a unique, somewhat sweet flavor. 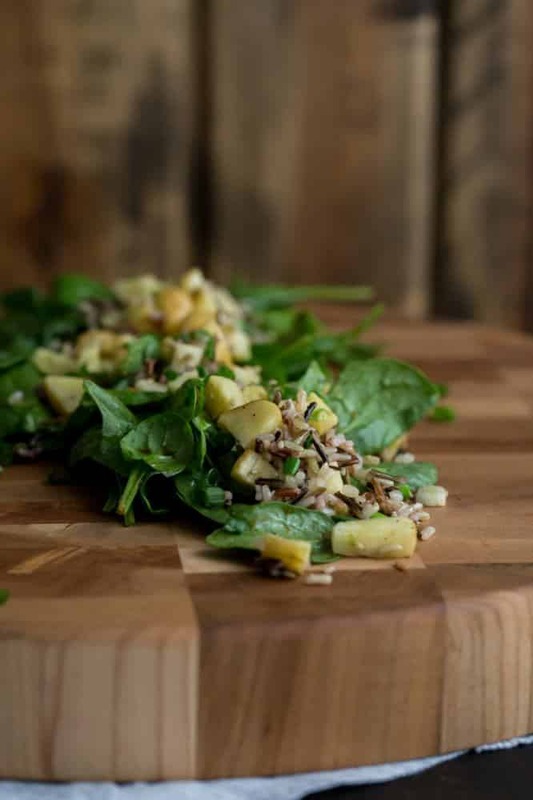 This spinach salad probably isn’t a combination one you might think of but I think it’s worthy of a try. 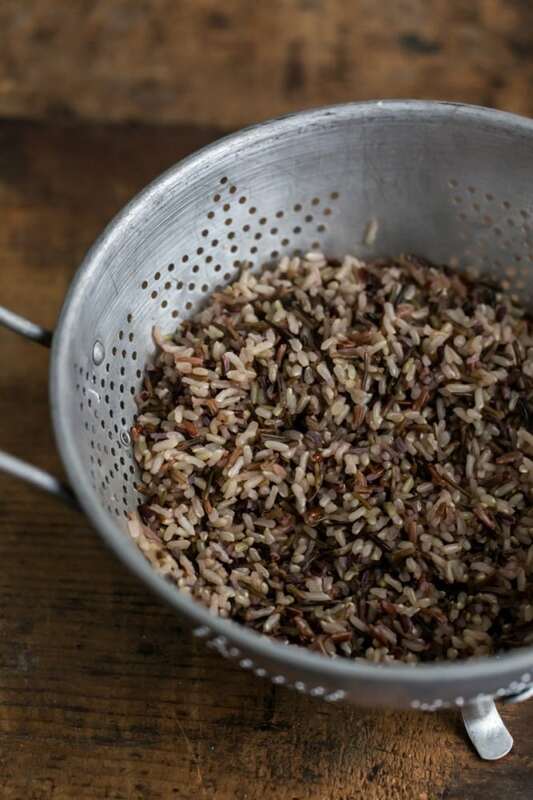 I’ll often make a similar salad with leftover wild rice from dinner the night before and by doing so, the salad comes together fairly easy (just wait for the parsnips to roast!) If you also happen to have rutabaga, I’d highly recommend throwing it in with the parsnips! Preheat oven to 400˚. Cube parsnip (peeling before, if desired) and toss with the 2 teaspoons olive, salt, and pepper. Roast until tender and lightly browning, 25 to 30 minutes. Remove parsnips from oven and drizzle honey over the sprinkle with diced green onions and sesame seeds. Stir until parsnips are well coated. Let cool slightly. 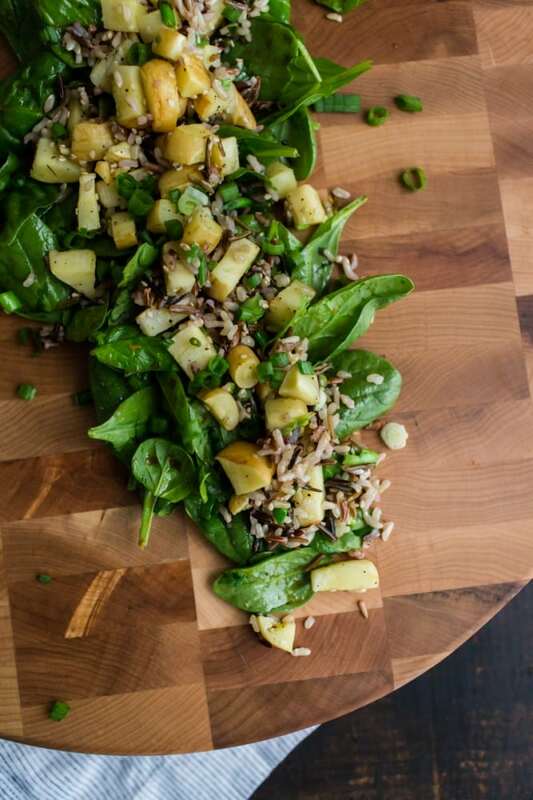 Toss together spinach and wild rice. In a small bowl, whisk together soy sauce, lime juice, and honey. Drizzle over spinach and toss to coat. 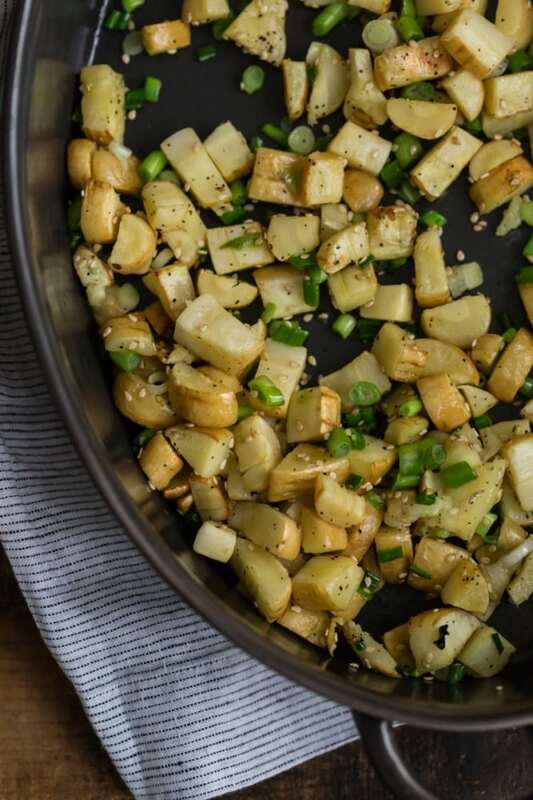 Add the roasted parsnips and serve with an extra sprinkle of green onions and sesame seeds if desired. I am on a Brussels sprouts kick, so I am looking forward to eating roasted Brussels sprouts mixed in with rosemary roasted potatoes. Yum! I’m most excited for the leftovers! I love making seemingly strange mash-ups of the leftover dishes that nevertheless turn out delicious. I am most excited for the pomegranate cake that I’m making 🙂 thanks for offering the giveaway! I’m most excited about cooking and eating Brussels sprouts! I still haven’t sold my whole family on them, but another try can’t hurt 🙂 I love using 101 Cookbook’s pan frying method. Oh this salad sounds wonderful. I can’t wait to have sweet potato casserole. And biscuits. Mmmm this cutting board is beautiful! I’m most excited for a butternut squash lasagna I’m making. Thanks! I just saw that I have parsnips in my refrigerator, with no plan to use them. So this recipe quickly became what I am most excited to take/eat at Thanksgiving. Also, anything with sweet potatoes. Because sweet potatoes are the truth. I’m most excited about a savory pumpkin rosemary bread from food52. going to try in as rolls! thanks! This salad looks fabulous, I love parsnips. But my favorite Thanksgiving dish is pumpkin pie. Did you see these are made in Grand Rapids?! So cool I think i may have to order one! And I know I will probably get tarred and feathered on a vegitarian blog, but I am super excited for a deep fried turkey! Thanks Brittany! We’re proud to handcraft all our butcher block products in Grand Rapids, Michigan. Deep fried turkey is a personal favorite, but we love everything Erin with Naturally Ella makes! 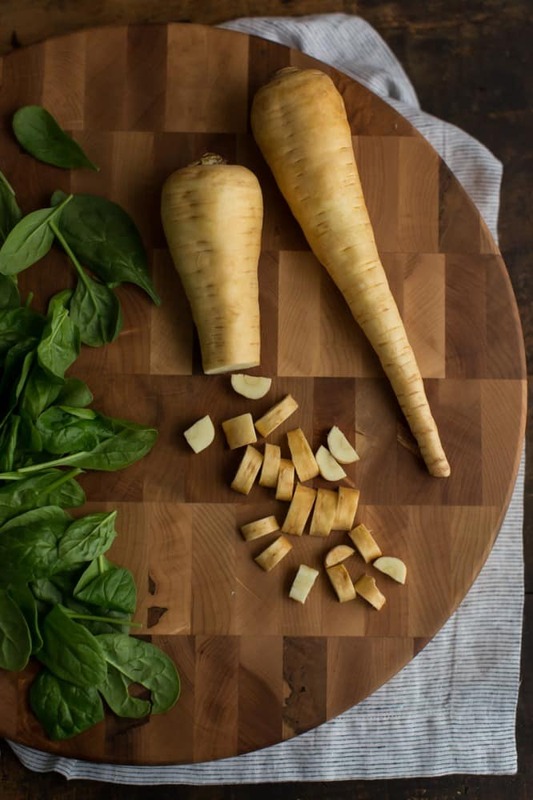 I adore parsnips – this salad looks wonderful Erin! I’m most excited for cranberries in all forms. Sauce, cake, salad, etc. 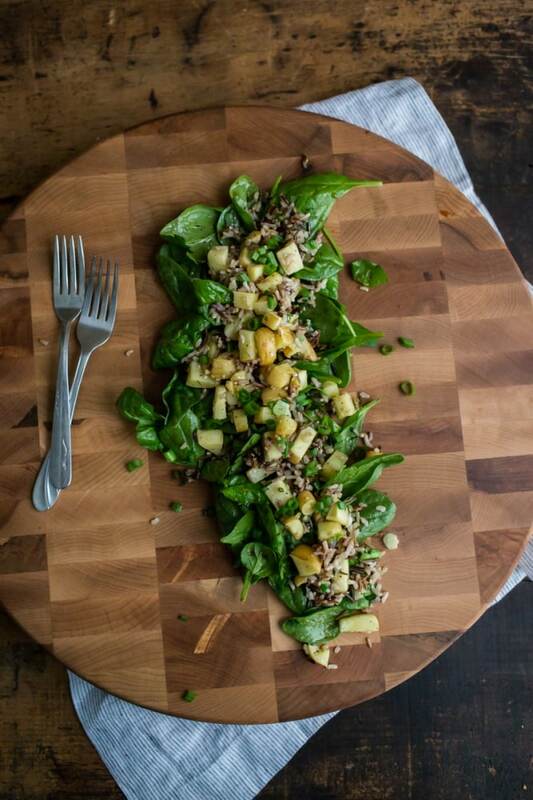 That cutting board is gorgeous! I’m looking forward to making twice baked sweet potatoes with curry and coconut milk and spinach. Not traditional but amazingly delicious. i can’t wait to make my first tofurkey-like roast! and an amazing carrot cake. for the bf’s sake, of course 😉 thanks for the giveaway! I’m excited for sweet roasted carrots and garlicky brussels sprouts! Cornbread and caramelized onion stuffing with maple glazed pecans. Yummy! I rarely buy parsnips (only once to make some soup! ), but this salad looks delicious and I think I need to try them roasted. Alwayyyyys excited for chocolate pecan pie! This looks amazing — I love parsnips, and can’t believe I didn’t know they existed 10 years ago. We’re having a non-traditional Thanksgiving now that turkey’s off the table (literally, because of a food allergy, thankfully not mine), and I’m not sure if I’m more excited about an experimental colcannon dish or the apple fritters. I’m really looking forward to green bean casserole. If you have your own favorite version I can’t wait to try it! So excited for some simple roasted Brussels and homemade garlic bread ! That cutting board is gorgeous!! For me, it’s all about the day AFTER Thanksgiving. Making turkey sandwiches for lunch with all the leftover fixings. A beautiful, colorful mess of a sandwich on a soft, seeded roll. That’s a hard question! Its going to be a tie between a sweet potato pumpkin soup (made from a big ‘ole farm picked pumpkin) or a spiced homemade cranberry sauce. I love sage dressing for Thanksgiving. I make it with 5 different onions. Your parsnip and spinach salad would be a nice addition to the meal too. Those cutting boards are gorgeous! I am looking forward to eating a vegetable wellington with butternut squash, fancy mushrooms, and goat cheese. Mmmm! Oh, and pumpkin pie!! That is the most stylish cutting board, ever! I am very excited about my Horseradish beet, green bean, and fennel salad. There will be lots of chopping next week for sure! nothing in particular as i don’t really celebrate thanksgiving as a big holiday – i try to be grateful ever day for the humble food i put on my plate rather than overdoing on one day. Gorgeous cutting board! I am looking forward to having my mother’s dressing – it has always been a favorite of mine 🙂 Hope you all have a wonderful Thanksgiving. apple pie! apple pie!!! apple pie!!!!!! I am most looking forward to eat a slice of pumpkin pie paired with some great coffee while sitting by the warm fire and surrounded by people I love! This year I am making the dinner for my father – a first. I am honestly most excited for the Stuffed Mushrooms which I only seem to savor once yearly and will probably spoil my apetite for dinner with the appetizer! I am most excited about the sides. Kale, parsnips, Brussels can’t wait! Beautiful cutting board! I’m most excited for the stuffing, and of course a slice of pumpkin pie for breakfast the next morning! A pear/almond tart and pecan pie! I’m looking forward to making a mushroom-based paleo stuffing with pecans, cranberries and sweet potatoes! I just discovered your blog and website and I’m totally in love! I feel like the movie Julie and Julia, but in this case it’s and Ellie and Ella — because i want to make every recipe on your site! I’m looking most forward to making your braised chickpeas and carrots for something colorful and different! Your salad and block are gorgeous! I’ve just recently discovered the deliciousness or parsnips so this salad is something I can get on board with! Thank you for your lovely recipe and this fantastic opportunity to win a butcher block from McLure Tables (stunning)! I get excited about cooking and eating, at just about every meal.. so Thanksgiving is no different. But if I had to choose one thing that I love to make during Thanksgiving, it would have to be a rustic gallette. Apple or pear with cranberry will suit me just fine. I’m most excited for my boyfriend’s apple pie with a crumbly top eaten with extra sharp cheddar. And green bean casserole. Always and forever green bean casserole! I’m doing ALL the cooking this year, so I’m most excited to make a veggie main dish to go alongside the turkey. Thinking stuffed acorn squashes or whole roasted cauliflower! Such a beautiful cutting board! And mashed parsnips are one of my most favorite things this time of year! I’m also excited to make a cassoulet for Thanksgiving this year, since the turkey won’t be enough for our huge family gathering! Love the idea. My husband grew up eating parsnips and I had never had them . Surprised to find out I really like them. This recipe will definitely do them justice especially on the beautiful wood board. I love parsnips too! I always add them to mashed potatoes, but I’ll have to try them roasted now. I’m in the midst of moving chaos – so I’m mostly looking forward to finally relaxing and seeing my family. But I’ll have to squeeze in the time to bake my usual round of pies (apple, pecan, and pumpkin). I love parsnips so much. I want to make this salad! I’m excited to try a new stuffed acorn squash recipe. My Thanksgiving buddy is demanding pudding this year, so I’ll have to go with that! I love this salad. I’ve never prepared parsnips on my own – it looks so easy! I’m so excited for allllll the foods at Thanksgiving. But really, most of all, the stuffing. And leftovers next day. I love a bagel with turkey! We have an abundance of wildflower honey from our local hives. I am making my Mom’s family recipe of diced,roasted beets with honey, candied orange rind and rosemary. The beets are served with farmer’s cheese (brie is great too) watercress and crusty bread on the side. Vegans can substitute with almond cheese. Country caviar at it’s best! I’m excited to be baking pies. Pecan and sweet potato. My husband will be doing the remainder of the cooking while I am out working. Looking forward to coming home to a great meal and spending time with my 4 leggeds. I am going to try a baking new savory roll, with cheese and olives. I think we are having ham instead of turkey, and I thought the flavors would go really well together, especially with leftovers. Thanks for the chance to win this gorgeous chopping board. every year, my favorite is the stuffed butternut squash from moosewood cookbook-filled with nuts, seeds, dried fruit, mushrooms and shallots-it just looks like Thanksgiving to me! Will definitely try this one soon! This year, I’m most looking forward to making bbq beef brisket instead of turkey. The salad looks delicious. I can hardly wait to make it. The cutting board is beautiful. I love the side dishes on thanksgiving. My favorite would be sweet potato casserole. Beautiful cutting board. Thank you for hosting the give away. I am most looking forward to the stuffing. We use my grandmother’s grinder and make it from scratch. This parsnip salad looks so good, it reminds me that I don’t eat it enough! The dish I’m looking forward to this Thanksgiving has got to be pumpkin pie! This is a very nice recipe and I really like roasted parsnips. I think I’ll make this for a work lunch. Definitely excited about making mushroom gravy! I noticed you didnt peel your parsnip, Ive never tried this…what is the skin like when left on? I am super excited for the cauliflower mashed potatoes this year! Delish. We’re doing a non-traditional Thanksgiving this year! So – I’m most excited for our dungeness crab feast! My family lives in Portland and there it’s a Christmas Eve tradition to eat dungeness crab. However, this year I’ll be spending Christmas with my man’s family in Wisconsin so my family thought we’d celebrate our crab feast during this trip home! love all of the photos and this recipe looks delicious! I can’t wait to try it! That was so good! Just made it tonight and both myself and my other half absolutely loved it. Thank youuuuu!